Washington County Sheriff's Office deputies and Tualatin Valley Fire & Rescue firefighters arrived to find a van inside an auto parts store that had struck a female employee at the parts counter. Firefighters and paramedics from Metro West Ambulance treated and transported the auto parts worker to Providence St. Vincent Medical Center with non-life-threatening injuries. The driver of the van was treated and transported to Tuality Hospital, also with non-life-threatening injuries. The female passenger of the van was unhurt. Based on witness interviews, a sheriff's deputy determined that the elderly male driver of the van was in a drive-thru at a local bank when he suffered a medical event. The driver accidentally reversed the van, which traveled approximately 70 feet before turning sharply. 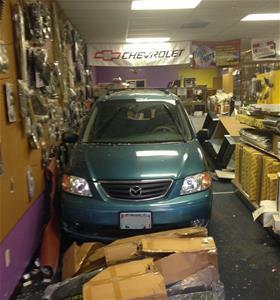 The vehicle continued in reverse, driving through a fence before hitting a parked pickup truck and continuing another 100 feet into the storefront of an auto parts business, ultimately striking a female worker inside.